With everything going on this month, Ade has had little time to spend in our own garden. 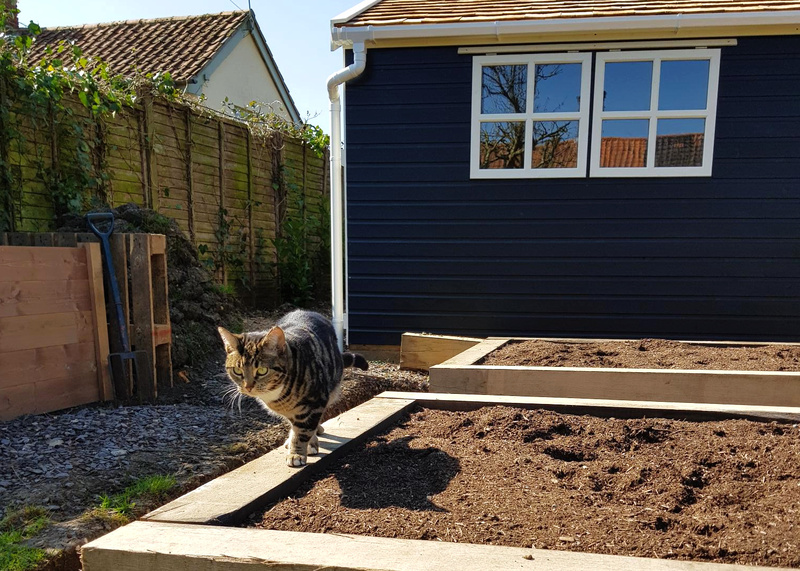 The raised beds, as you know, are ready and waiting and filled with lovely, rich Dalefoot compost, while the first of Ade’s seedlings are sprouting happily in the greenhouse. However, a rather unfortunate development has come to our attention. Daisy, our diva of a cat, doesn’t think our vegetable beds are vegetable beds. She thinks we’ve built her six palatial litter trays. Both of us have caught sight of her from the house, at one time or another, squatting defiantly upon each one of Ade’s brand new, meticulously prepared beds. ‘But this was meant to be my first proper attempt at no-dig gardening.’ He said forlornly. We’ll have to make sure we get it all out as cat waste is very bad news for veg gardens. Sadly for us, it doesn’t have the benefits of chicken manure, and can actually be quite dangerous. So, another job to add to the ever-expanding to-do list. And a cat that requires some serious disciplining. Maybe it’s time to get that dog we’ve been talking about. Irritating and funny at the same time. Good luck with keeping that cat out of the beds. Might have to build covers. Try getting a litter tray so she’ll go there instead?